What makes a great trilogy? Three stories that combine to make one, but are themselves also valid. Each book should have a start, middle and end that combine together to make a longer narrative. There are not many things worse for a fantasy or science fiction reader than getting their hands on a ‘filler’ second book. That awkward book in the middle that just continues the story and adds little. We already know who the characters are from book one and look forward to the conclusion in book three. Who looks out for poor book two? Not Bernd Perplies and Christian Humberg. USS Prometheus’ adventure started in Fire with Fire continue here in The Root of All Rage as the crew draw closer to the reason why the once peaceful and introverted residents of the Lembatta Cluster have become outward looking (and not in a good way). Not all the locals are members of the violent Purifying Flame so The Federation are reluctant to blame all. Therefore, it is not great news that the Klingon ship Bortas is also part of the mission and their Captain is so aggressive he even gives Klingons a bad name. I have been known to read books out of order, but in the case of trilogies try to read them in order. If you picked up Root to read as a standalone title you will be a little disappointed as it feels like a link between the first and third books, offering little to establish itself. The investigation started previously continues as does the tensions between the Federation and Klingon High Council. The temperatures may rise or fall, but the basic relationship at the start of Root have not changed by the end. By 600 pages or so into the series you start to realise it is a little overwritten in places and could have been edited into two titles. Perplies and Humberg are interested in the inner machinations of Federation and Klingon politics. For Star Trek pedants, this will be clover. 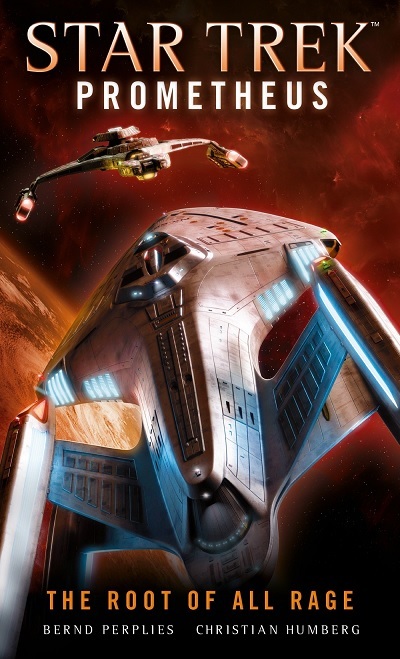 However, many readers pick up a Trek book for their breezy nature and characters that you recognise. As this is a Prometheus novel you do not even get this luxury as most characters are unknown to the casual fan or sparingly used if they are famous. Spock is present, but a side character. In the acknowledgments it appears that this was a translated Trek book and perhaps a little of the punchy action was lost in translation. Having not read any German science fiction that I know of, I am unware it is all as earnest as this. As well as translating, some pruning could have also come in handy. When the action hots up, it is good. Towards the end of the book there is a great action set piece that sets up the final outing, you just have to sit through 200+ pages or more of exposition like in the first book. Perhaps the biggest sin is that Root does not end in its own right, but instead finishes midway through what is obviously a bigger story. You get no sense of closure from this title and if you did have to wait several months to get In the Heart of Chaos you would not be happy. Although Root feels a little like filler it does not prevent the three books as a whole being decent. A heads up for a future review, the next book in the trilogy is back on form. Written on 30th January 2019 by Sam Tyler.